I thought moving to Italy would expand my son’s diet into the far reaches of foreign flavors and textures. He already liked olives and peppers. We seemed to be on the right track. But for some reason, living in Rome has contracted his taste. His favorite choice, when it comes to dinner, is pasta bianca or pasta rossa. And usually, he’ll choose the bianca: pasta with olive oil and grated parmesan. He seems to have given up green things, which drives me nuts, because there are so many more wonderful green things here than there have been anywhere else he’s lived—except Berkeley, where he lived when he was just cutting teeth. Green leaves with cheese, green leaves with nuts, green leaves with sweet onions, green leaves with grains, gazillions of great greens! He won’t have any of it. The third important category of the rossa/bianca divide is pizza. Pizza rossa is a thin, tasty crust spread with savory tomato sauce; each good forno will have its own sauce, some more salty or herbaceous than others. Pizza bianca is a bubbly pizza crust topped simply with olive oil and salt. Again, each forno’s dough has its own taste and consistency, and is topped with more or less salt. You can also order pizza bianca morbida (soft) or dura (hard-crunchy). My favorite place to buy both is Panificio Beti, in our neighborhood. The lines are always long, and the family behind the counter always bustling and full of banter. These Roman basics serve as snacks or sides at any time of the day. Italian life is riddled with rules, but, as far as I can tell, pizza rossa and bianca exist in a looser realm. As a rule, Italians don’t eat on the run the way Americans do. Even to-go coffee is a very rare sight. 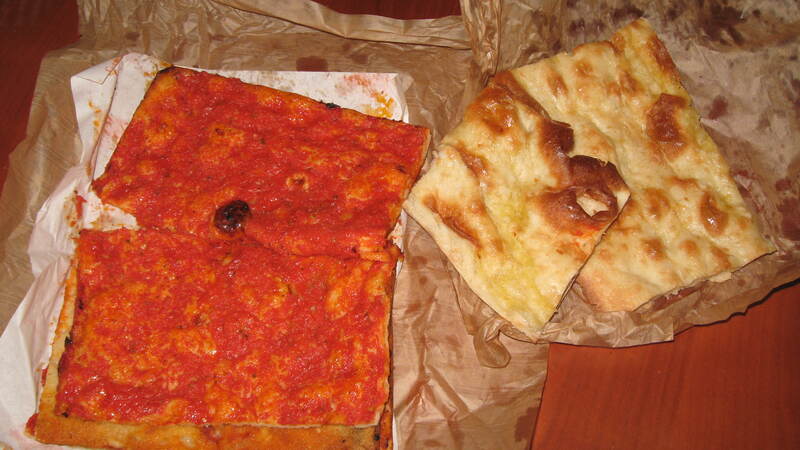 But pizza rossa can be eaten with dignity while one is walking along the sidewalk. The pizzeria guy will cut a piece in half, slap the parts together sauce-side-in, and wrap the bottom half in a piece of paper—a process that takes about a second and a half—so the snack is ready to eat as soon as it passes from his hand to yours. I’ve seen people eat it for breakfast, for elevenses with beer, for a late afternoon snack, and for dinner. Last night, still satiated from the big Saturday Academy lunch, we had salad, pizza rossa, and vino rosso, for dinner. Jack had the white ribs of the lettuce, pizza bianca, and milk. I wish he’d broaden his taste at least to complete the color combo of the Italian flag. It’s rainy, school’s out, and everything’s closed for the feast of the Immaculate Conception. We made pizza for lunch, and now Jack is busy with various projects involving wooden trains, plastic tractors, blocks, legos, paint, and books. I’m drinking espresso, listening to Let It Be, and reading various things on the Slow Food website. In 1999, Slow Food launched the Presidia project which has since involved thousands of small producers across the world, strengthening local economies and saving cheeses, breads, vegetable varieties and breeds from extinction. The worldwide Terra Madre network was launched in 2004 to give a voice and visibility to these farmers, breeders, fishers and artisan producers, and to bring them together with cooks, academics, youth and consumers to discuss how to improve the food system and strengthen local economies. Today the Terra Made network is made up of more than 2,000 food communities. Here at the American Academy, we’re going to celebrate by making the family dinner, on Friday night, a Terra Madre feast. Mona has done an amazing job over the past few years of connecting with farmers and food producers in the area, and this meal will also mark the birthday of the American Academy’s Rome Sustainable Food Project as a Slow Food Community. I like how the Terra Madre poster explains the impetus behind this event: “Animati dall’entusiasmo di Mona Talbott….” Yes! Many great things that happen here have been animated by the enthusiasm of Mona Talbott. I’m excited for this meal, as is Jack, because he gets to help, with the other kids, to make orecchiette and harvest lettuce from the garden. A bunch of lucky school kids in Rome will get to go to the Italian School of Film Animation to watch Ratatouille and Totò Sapore e la magica storia della pizza. (Sounds fun. I’d like to see it.) There are also compost and juice-making workshops for ragazzi e bambini. Ooohh, fun! Dirt and fruit, sticky hands, making messes! I highly recommend reading Slow Food International’s Seven Pillars. This is where it’s at. For other Slow Food items of interest, you can check out their website. And here’s a description of the Terra Madre celebrations. In my last post, I attempted both to recommend Food Inc., and to criticize what I saw as the overly facile closing message (“vote with your fork”). There was more to the event, here at the American Academy in Rome, and there is a positive alternative to the dark suggestion of the film that Monsanto may well take over the world. Briefly, these follow-ups/upsides have to do with braised pork and grass-roots. Let’s start with grass-roots. Since the screening, I’ve talked with a lot of people about how depressing the film is. It seems to offer only the meager solutions of “voting with your fork” and waiting for policy change to adjust the prices of food. Obviously, more needs to be done and can be done. One of the people I’ve talked with a lot about these issues is Mona Talbott, the executive chef here. She is passionate not only about great cooking but also about reforming American food culture through cooking education. An over-reliance on convenient but unhealthy fast-food is in part a consequence of a general lack of cooking skills and knowledge. Another part of the problem is the misconception that fast food is cheaper than home-cooked food. This doesn’t have to be the case. The Rome Sustainable Food Project works on a tight budget to provide nutritious, delicious, and sufficient food for all of us. Mona points out that the world’s oldest traditional diets, like that in Italy, have had such long histories of sustaining people in part because they can sustain—with complete nutrition—the most people. In other words, traditional diets are complete, and they are poor people’s diets. The basis of the Italian diet is the lowly triumvirate of beans, grains, and greens. These are affordable. Pasta is cheap. The cheapest cuts of meat are delicious when cooked slowly. But cooking, which often isn’t learned in the family anymore, needs to be learned if families are to be fed on these inexpensive foods rather than on fast food. Actually, many people don’t know anything about food anymore, much less cooking! If you take a look at my friend Sharyn’s comment on my last post, you’ll see what I’m talking about. She teaches in a university, and her students don’t know about the seasonality of any foods. Several things need to, and can, happen, with a grass-roots effort. More communities can take on the reform of school lunch on their own, and even put in edible schoolyards (playground gardens) and teaching kitchens. Children, then, can teach their parents about seasonality and cooking. Or they can learn about food and cooking by asking their grandparents, as their doing with the help of Bioversity’s campaign Diversity for Life. Cooking schools can teach home cooking. Institutional kitchens—like the one here, with its unpaid interns—can double as educational kitchens. Old routines, like canning parties, can be revived. (Mona mentioned this today, and you might recall one of my recent posts about the biodiversity scientist I met recently, Stephan, who has fond memories of tomato-canning parties in a neighbor’s garage.) Children can be taught the basics of cooking, and along with those, the comforts and thrills of cooking, by being included in the process of growing and making food. With the encouragement of children and community-based campaigns, working parents can be convinced to plan ahead and find the time to put together a healthy meal—even if it’s just rice, beans, and something green. Mona, who has cooked for the best restaurants and wealthiest people, wants to devote herself to this grass-roots cooking re-education effort when her tenure as the head of the Rome Sustainable Food Project ends. She’s a real inspiration.